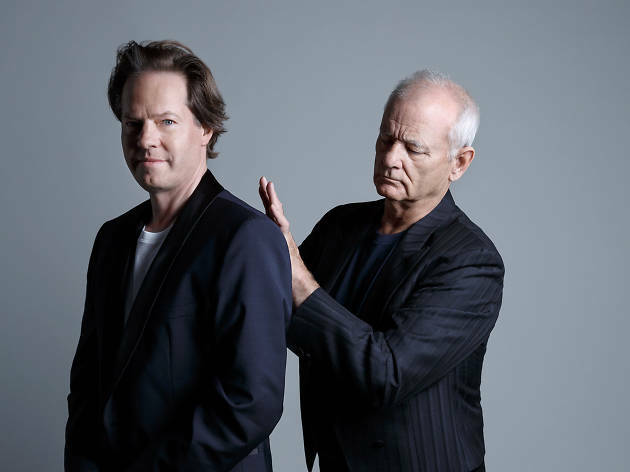 As far as stories go, the beginning of this one isn’t particularly remarkable: Cellist Jan Vogler and comedy legend Bill Murray first met when they struck up a conversation on a trans-Atlantic flight. Eventually the friendship developed into an unexpected musical partnership and an album, New Worlds, released in August. Combining music by Van Morrison, Henry Mancini, Leonard Bernstein and George Gershwin with Murray’s affecting, assured readings of text by Hemingway and Twain, it’s a surprisingly cohesive journey through a broad range of Americana. The pair delve into the material again, with Vogler’s piano trio, at Carnegie Hall on Monday, October 16. Time Out New York caught up with the German-born, NYC-based cellist to ask him about the unlikely pairing. How did you and Bill go from that chance first meeting to a musical partnership? It’s really very rare in life that something is completely born out of friendship. We’re in very different fields but we liked hanging out together. After two years, Bill invited me to a Poetry Walk [an annual event hosted by Poets House] and at the gala after, he recited a poem by Walt Whitman. That was so fantastic, and I started thinking maybe we could do something together. Bill is both reciting and singing on the album. I think it’s fair to say, though, that he’s not conventionally thought of as a great singer. The singing is the important link. I think he’s a great storyteller and he has a very good ear. He has great timing. And every word sounds different. That’s so important when you sing. Were there any special considerations you had to make in working with someone who wasn’t classically trained? No. There was never any reservation. When we started working, we were so confident. The classical music business needs a lot of cross-pollination because classical music shouldn’t be an elite little world. We need to open up to fresh energy. Otherwise we’re just repeating the same music that was composed centuries ago. Do we really find inspiration in that? How did you go about selecting and developing material? We met for dinner, and he sang and I played something. It was an evening full of good food and good music. It was really fun, so I drew up a list of songs we could do and he liked the list. We would meet in the morning and work all day. Then we did two shows, one in New York and one in Berlin by invitation only, and we were surprised how strong the reaction was. Did you know about his Saturday Night Live character Nick the Lounge Singer when you started? No! I discovered this very late, when people started telling me about it. I had to listen to it, and I thought it was fantastic. He has so much confidence in what he does. He brings that to the show and that’s really key. Bill is extremely funny. It’s some kind of genius talent he has, and humor is maybe the greatest art in human existence. It really goes to your heart. If you think something is funny, it makes your day. Bill Murray, Jan Vogler & Friends play Carnegie Hall (carnegiehall.org). Monday, October 16 at 8pm; $40–$250.